I have a problem in my living room that I’m hoping you can solve! Our living room faces to the North, but the room is dark, as there is no window, we also really need additional storage. We would like to install a big window, but the room faces straight onto the neighbors’ deck. Email from Brian – Hendra. You really need to take advantage of that Northerly light, as from the image that you sent the room is very dark indeed. I would suggest installing high storage cabinets that are the full room width in length, and then install a high window above also the full width of the room, to provide that critical Northerly light, as well as keeping your privacy for you and your neighbor. 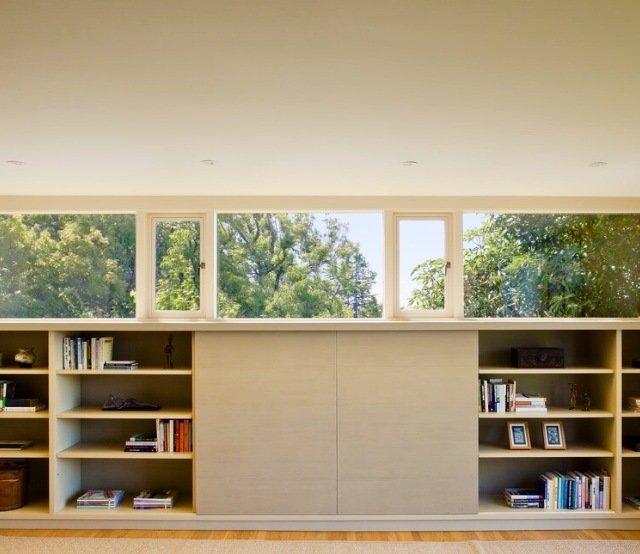 Consult with an engineer, to ask if it is possible to also install a slim line window at floor level, with the cabinet floating in between the windows for additional light, and a less heavy feel to the room. Will be a great room when finished, Good Luck!